A Cape Town Castle Military Museum tagged image from photographer – conner395 as published on Flickr. 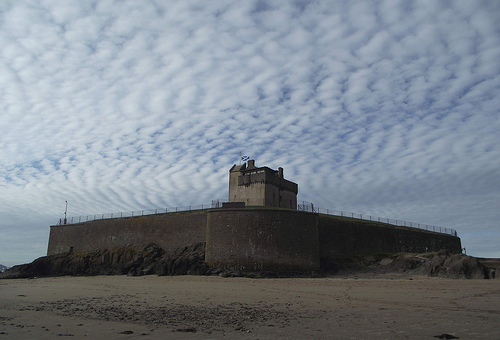 I was brought up nearby to Broughty Ferry, and was always aware of its fairly wee but very imposing Castle. Yet I had never really paid it any great attention until last week, when making a brief nostalgic detour into the area, in order to show my 8 year old grandson the places I used to frequent when I was his age before moving to Inverness (50 years ago!) and where his mum and her sisters used to play when we visited my cousin (who lived right opposite the Castle then) on family holidays. Perhaps it was the unseasonably gorgeous weather, or the fact that we had a wee while free time, or the fact that for the first time in that area I had cameras with me, I do not know – but I have never seen the Castle looking so photogenic! I must also admit that I went inside, for the first time ever – it is maintained by Historic Scotland and the museum within is run by Dundee City council. Admission is FREE! It is well worth a visit, but the spiral staircase is hard work! Broughty Ferry (Gaelic: Bruach Tatha, Scots: Brochtie) is a suburb on the eastern side of the City of Dundee, on the shore of the Firth of Tay in eastern Scotland. "The Ferry" was formerly an independent burgh from 1864 until it was absorbed into the Royal Burgh of Dundee in 1913. Indeed the Burgh’s small police force (prior to absorption into Dundee City Police) had Broughty Castle as the centrepiece of its cap badge. Broughty Ferry became a popular suburb of Dundee when the Jute barons (jute being big business in Dundee) in the 19th Century) built their mansions there, and the mill workers made great use of the sandy beaches which run from the Castle right down to Monifieth (my former home town) and beyond. Broughty Castle was built in 1496, on the site of earlier fortifications, and provided an ideal location to watch over the Firth of Tay at its brief narrowing before it widens out again on the approach to Dundee, which was ever a strategic port. In 1846 the castle was bought by the Edinburgh and Northern Railway Company in order to build an adjacent harbour for their railway ferry (before being rendered obsolete by the building of the Tay Bridge a few miles upstream). In 1855 the castle was acquired by the War Office with the intention of using it to defend the harbour from the Russians. In 1860 renewed fears of a French invasion led the War Office to rebuild and fortify the site. The walls of the main courtyard were rebuilt and new wing and courtyard were added to the tower. A caponier was added along the south-east side of the courtyard. Emplacements for nine large guns were also constructed. A small enclosure on the west side of the courtyard was also built.